Our aim is to find investments that are likely to be undervalued by employing a three step process designed to identify a broad set of potentially undervalued securities; exclude those failing to meet our quality criteria; and then prioritizing opportunities based on our assessment of quality and valuation. Following our analysis of target investments, we thoroughly assess the quality of each company and rigorously estimate a range of intrinsic values. 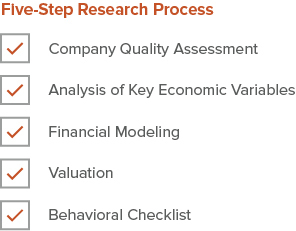 This process focuses attention on several salient factors, from the company’s quality to an analysis of key economic variables likely to impact the company, to stringent financial modeling and valuation, followed by a rigorous behavioral checklist, where we challenge our own research and potential biases in determining a company’s value. This final stage is designed to manage risk – in our view the potential for permanent capital loss. We size positions to ensure that an adverse outcome on any single investment will not impair the portfolio to a significant degree. We also manage risk by thinking through the correlation of long-term business outcomes among multiple investments. We allow our overall process to drive long-term results rather than being over-reliant on any individual investment decision. Further detail on our Investment Process may be found in our “Owner’s Manual”, which we are happy to provide upon request. Please tell us a little about yourself and how you approach investing. Thank you! We will contact you within the next 48 hours. Please check your e-mail filters if you do not receive a reply.